Search MLS on the go! View some of My Past SOLDS! 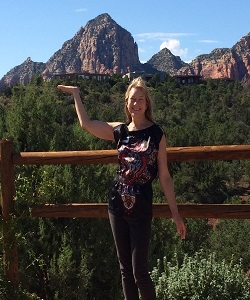 “Basically, I live, work and play among the Sedona Red Rocks and who wouldn’t want to live in this Paradise? I’m here to help all clients past and future determine what their goals are and help them achieve it!” On top of all that many clients and referrals learn that I do quite a bit to give back to my community and why not? We all live here and care about our communities so we should all give of our time and/or funds here locally. I give of my Heart to each client and truly work hard to ensure what they need happens – this ultimately is why they refer others to me. Search for Sedona Homes and sign up to have the information sent to yourself directly on a periodic basis. Click here to get a FREE home evaluation. "Art washes away from the soul the dirt of everyday life."